I love walls. I love them so much I once gave a talk about them, using a wall. And I know you love them too. 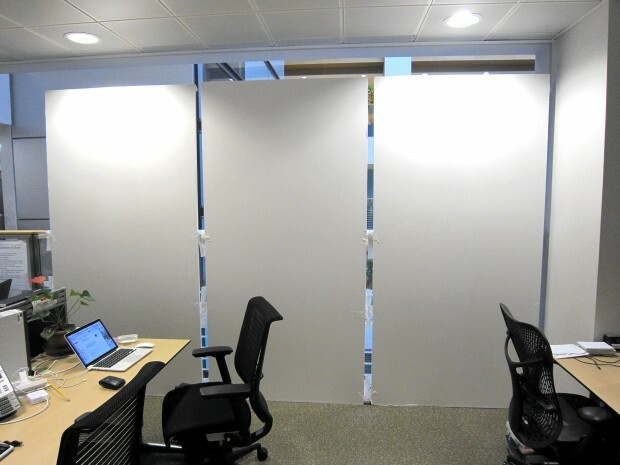 Only recently, my colleague Kate Towsey wrote about the way we use walls covered with research findings as 'vertical campfires'. But what if you don't have a wall handy? Or you're not allowed to stick anything on your walls? One solution is to have something portable, which you can pull out and use when you need it. My friend Harry Brignull collected some great ideas for creating portable wall spaces. Another solution is to create something more fixed, the way I did recently at the Passport Office. We were short of wall space, so I built a temporary research wall on a balcony rail. In the rest of this post I'll explain how I did it. My wall was made of 6 sheets of 8 x 4 foot x 10mm foam board. If you shop around you can get 12 sheets for less than £250. To hold it together I used a reel of white duct (gaffer) tape and a pack of cheap glue sticks. Large sized and 10mm thick foam board sheets are quite fragile, so I started by gluing pairs of sheets together with the glue sticks. I then sealed the edges with duct tape. Two 10mm sheets glued together and taped are much stronger than a 20mm board. Think plywood. To fix the sheets to the balcony, I simply taped them to the top and bottom balcony rails. In a few hours I had stuck up prints of our prototype and research findings, and we were up and running. Have you built your own wall? 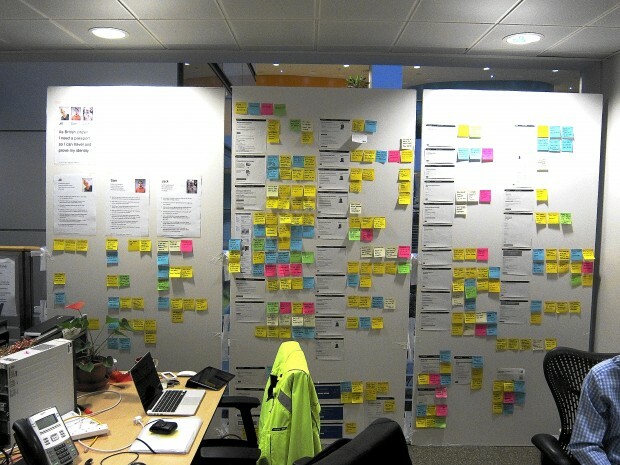 If you've built your own temporary or portable research wall, or improvised a research wall in some other way, let us know. We'd love to see it. Feature photograph by Allan Harris and called 'Hadrian's Wall walk - turret'. Used under a Creative Commons license. What does this mean? Tips for testing your words. This is awesome! We are using a rolling marker board for a scrum board, parked without permission in an aisle, but we need more space for UI and UX content.